Contemporary Psychoanalytic Field Theory articulates the theory, heuristic principles, and clinical techniques of psychoanalytic field theory. S. Montana Katz describes the historical, philosophical and clinical contexts for the development of field theory in South America, North America and Europe. Field theory is a family of related bi-personal psychoanalytic perspectives falling into three principal models, which developed relatively independently. One of the principal models is based upon the work of Madeleine and Willy Baranger. The second, constructed by Katz, draws upon what is held in common by the implicit field theories in the United States of the interpersonal, intersubjective, relational and motivational systems’ psychoanalytic perspectives. The third is based upon the work of Antonino Ferro. For each, Katz elucidates its conception of mind, unconscious processes, the specific field concept employed, therapeutic goals, and clinical techniques. Similarities and differences of the models are illustrated. In the book, a fabricated analytic process is offered in which an analysand, Zoe, is engaged in three analyses. Each analyst works with the techniques of one of the three field theories. Katz conveys the diverging thought processes and technical choices of each analyst and the potentially different therapeutic outcomes of the application of each model. In the final chapters, Katz moves beyond the specific field theories to articulate a concept of a general field which underlies the three field concepts. 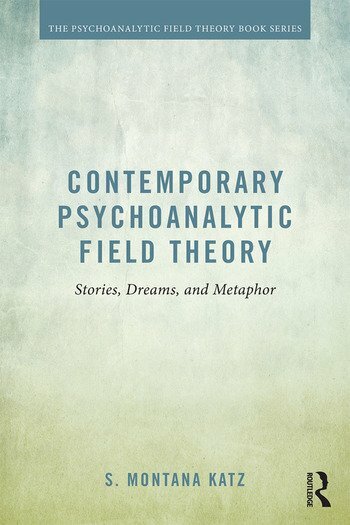 She explores how to use this generalized field to find a form of common ground amongst the field theories, conjecturing that this generalized concept has application beyond field theory to a greater range of psychoanalytic perspectives. Contemporary Psychoanalytic Field Theory provides a clear and comprehensive guide that will appeal to psychoanalysts, psychoanalytic psychotherapists, mental health professionals and clinicians, as well as philosophers, psychologists, sociologists and anthropologists. Chapter 5 The Third Model of Psychoanalytic Field Theory: The oneiric model. S. Montana Katz is a founding co-Director of the International Field Theory Association. She is a Training and Supervising Analyst and Senior Faculty Member at the National Psychological Association for Psychoanalysis. "Analysts have come increasingly to recognize the relevance of a rather vaguely apprehended "field theory" to psychoanalysis. In this rigorous and ground-breaking book, Dr. Katz articulates and clarifies the theory, heuristic principles, and clinical techniques of psychoanalytic field theory. Dividing psychoanalysis into three models—mythopoeic, plasmic and oneiric—allows her to offer an imaginative analytic process. An immensely thoughtful and scholarly effort and a seminal contribution to a revitalized interest in the relevance of field theory to psychoanalysis"-Edgar Levenson, Fellow Emeritus, Training, Supervisory Analyst and Faculty, William Alanson White Institute, 2006 Mary S. Sigourney Award winner. "Katz is at ease in the din created by the voices of many people expressing different thoughts. She imagines them as if they were workers, who are working in one and the same site. Montana is well aware of the fact that individuals are important, but the collective enterprise is what really matters: the attempt to build a psychoanalytic field theory, both consistent and useful to clinical practice. Montana, in this book, tells the story of this undertaking, giving a valuable contribution of ideas and clarifying the general framework. "-Claudio Neri, M.D, psychoanalyst, founding member of The International Field Theory Association. "Montana Katz offers us the first comprehensive comparison of the different kinds of psychoanalytic fields. With her incisive and probing discussion, rich with clinical illustration, Katz points the way to the future of bi-personal fields in psychoanalysis. "-Madeleine Baranger, Argentine Psychoanalytic Association, 2008 Mary S. Sigourney Award winner.